The Samsung Galaxy S IV will not make an official debut at the Consumer Electronics Show that kicks off in just a couple of days in Las Vegas. That’s no surprise as Samsung is widely expected to announce its new Android flagship around April this year, but what could be a slight surprise is that early models of the Galaxy S IV will be at the show, but under tight supervision and behind closed doors for only a few top executives to see, according to South Korean website MT. 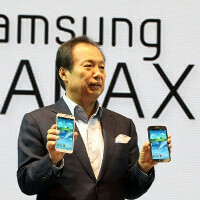 Samsung Electronics Vice Chairman Jay Lee is allegedly the person who will be at CES and the one to show the upcoming Galaxy S IV to carriers and other high-profile partners. Moreover, the report goes on to once again say the Samsung Galaxy S IV will indeed have a 5-inch 1080p display and run on Samsung’s Exynos 5440, a quad-core ARM Cortex A15-based chip. This might sound a bit strange to you, but what the Samsung executive will be showing is likely a non-final prototype of the S IV to partners that will need some information about that device before they decide how much of it they would want, and so on. All of this is ordinary, and is going behind the scenes, without the end-user hearing much. At least we know that Samsung is ready with some kind of a prototype to show off, and that’s already something. What’s more interesting, is that we even saw a leaked picture of the Galaxy S IV, stripped off the physical buttons. That could be an interesting decision to keep the device at around the same dimensions and relatively comfortable for one-handed use despite the larger screen. Can't wait for the Galaxy S4!!!! S4 is most anticipated phone right now and it deserves a separate unveiling. While i agree, i think it's too soon for Samsung to unveil the S IV. Yes, It's a premium phone that needs a sole, separate and a big launch. It would be better if Samsung unveil the phone a few days prior to the launch...i think that would have more surprise value for the fans. Q2 for S4, Q3 for Note3. There will be a few months gap between the two. Your Android Authority link is broken. They can't really go over the top with the internals compared to high end phones being showcased at CES. 1920x1200? OLED? Flexible display? Better camera? S Pen? Android 5.0? Not likely. I think this year is for Samsung tablets. Note 2 10.1 sounds promising. It will be released in 2nd qtr (Apr-Jun). Every thing looks great, but needs home button and durable body to make it a perfect device. burn in hell iphone 5 !!! The Galaxy SIV would surely crush the iPhone5 a couple of times! Y is that the phone u have mention? This article is about the gs4. Lucky a$$ executives. They even shouldn't even see the new model till the press conference all they do is sit on their lazy fat a$$e$. But still EXCITED ONLY THREE MONTHS TO GO!! T3 Middle East also says that the GS4 is in CES shown to selected persons. The Galaxy S4 will be great i am sure. But I will be purchasing the Galaxy Note 3 that's Samsung's main device in the family.